Get Your Sprinter Van Loan at Truck Loan Center! You’ve done the homework and have decided to get a Sprinter van to add to your fleet. For those who do a lot of driving, a sprinter van loan or lease is one of the best choices you can make when it comes to fuel economy (if you choose a diesel option). If in a year you drive 50-thousand miles around North America, that would make for a difference of about $4,000 in fuel savings over a comparable gas-powered van! This adds up to quite a lot of savings when you consider how much driving you are going to be doing throughout the life of the vehicle. Sprinter vans come in a range of styles and functionalities that are designed to haul both cargo and people. Sprinters come hailed as Freightliner, Dodge, or Mercedes Benz but they’re all 100 per cent Mercedes Benz. 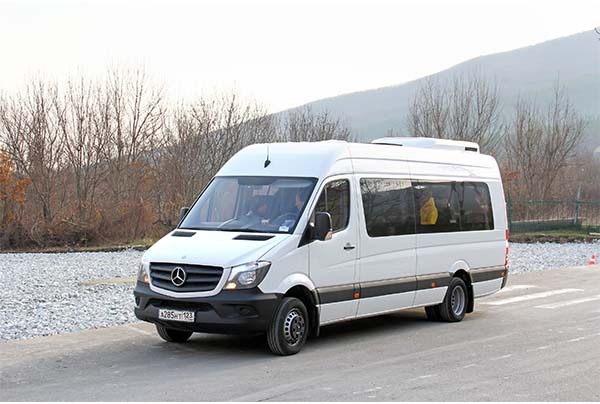 Mercedes Benz Sprinters were introduced to North America in 2002, having been popular throughout Europe for some time. The sprinter is, indeed, a jack-of-all-trades. This van includes a variety of safety gear, like crosswind stabilization, collision prevention, and lane-departure warning. It also includes two available powertrain options, including a 161-hp 2.1-liter turbo-diesel and a seven-speed automatic with rear-wheel drive or a 188-hp 3.0-liter turbo-diesel V-6 with a five-speed automatic and rear or four wheel drive. Now that you’ve made up your mind about purchasing a sprinter van, it’s time to see a Truck Loan Center professional who’ll work to get you the best sprinter van loan and sprinter van lease options possible for your new addition – low interest rates with favourable terms. Where business is concerned, it is not just the amount of financing that you have access to, but the type and fairness of the financing that you have access to which will ultimately determine your success. On the flip side, if this is all new to you, we can help you secure your first van or truck loan, or van/truck lease. We do our best to give you clarity, making sure you leave our office knowing you received the best service to fit your individual needs. No one client is ever the same, nor are their needs, and we incorporate individual client considerations and limitations into how we go about securing truck loans and truck leasing so that you end up with the financing that makes the most sense for you. At our first consultation, we’ll tell you exactly what we need from you so we can help you the best we can. The more info you provide, the better we can position you in front of our lenders to actually create a bidding war for your business to get you the best deal for your truck loan or lease. Truck details – tell us about the Sprinter van you’d like to buy and from where you’d like to buy it. Why should I choose Truck Loan Center? When it comes to van, truck and trailer financing and loans, we’ve got it going on! We’ll help you secure the best van loan or lease possible for your specific circumstances. We want our customers to have access to the best credit possible. When your business thrives, so do we. We want our customers to keep coming back to us for years to come which is why we treat your business as if it were out of own. Just so you know, we’re your partner in the truck loan process. We ensure that you can meet with your dealer and already have a pre-approved loan amount in place so there’s no risk that you’ll go over budget. Everything is planned from beginning to end with efficiency in mind. We have industry wizards at Truck Loan Center who’ll help you develop a financial plan for securing your van loan or lease. Let the team at the Truck Loan Center be your partner in finance. Call us, get your approval today and step into your new van in no time.